JNN 22 Aug 2014 New York : U.S. police said early on Tuesday they arrested 31 people, including a journalist, during another night of racially charged protests in Ferguson, Missouri, sparked by the fatal shooting of an unarmed black teenager by a white policeman 10 days ago. Police and protesters collided in the streets of Ferguson again late Monday, a day after the Missouri governor summoned the National Guard to help restore calm to the St. Louis suburb, AP reported. Protesters filled the streets after nightfall, and officers used bullhorns to order them to disperse. Police deployed noisemakers and armored vehicles to push demonstrators back. During one confrontation, officers fired tear gas and flash grenades. There were no reports of serious injuries. After the streets had been mostly cleared, authorities ordered reporters to leave as well, citing the risk from gunfire that had been reported. State Highway Patrol Captain Ron Johnson, briefing reporters on Monday’s night’s violence, said “our officers came under heavy gunfire” in one area. Johnson separately told CNN that two people were shot within the crowd, but not by police, and were taken to hospital. There was no immediate word on their condition. Demonstrations have flared since Brown, 18, was shot dead while walking down a residential street on August 9. The violence has captured headlines around the world, raising questions about the state of U.S. race relations nearly six years after Americans elected their first black president. An overnight curfew has been imposed and the National Guard, the U.S. state militia, has been deployed in the St. Louis suburb of 21,000 people to stop looting and burning that have punctuated the protests. There have been protests over Brown’s killing elsewhere in the United States including in St. Louis, New York, Seattle and Oakland. Police commander Johnson said some of those arrested had come from California and New York. 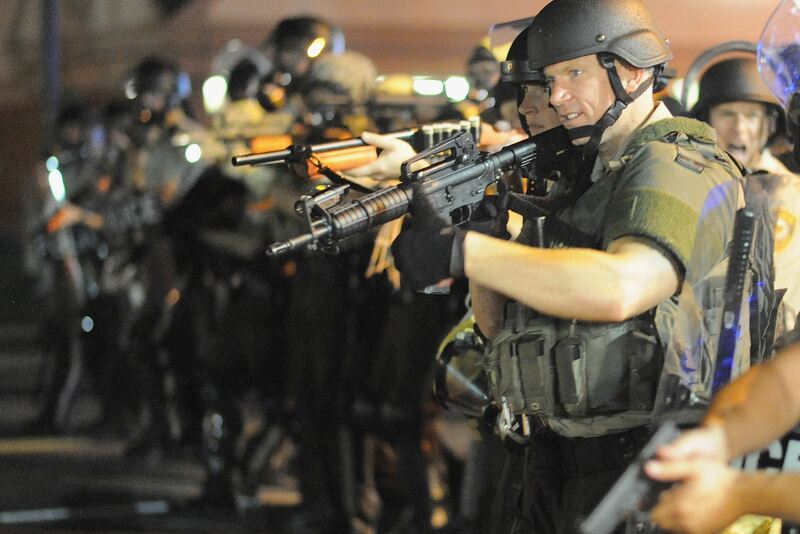 Missouri Governor Jay Nixon declared a state of emergency in Ferguson on Saturday and a curfew from midnight to 5 a.m. He also mobilized the National Guard to back up state police. An Iranian Foreign Ministry official on Tuesday voiced concern over the use of violence against blacks in the United States. “Targeted discrimination against blacks in the United States by the country’s police and judicial system and the crackdown on popular protests following the recent incident are a clear example of the violation of the rights of people of color in the United States, which annually issues numerous reports about human rights violations in independent countries,” Iranian Foreign Ministry spokeswoman Marzieh Afkham said in reference to the ongoing racial unrest in Ferguson, Missouri, triggered by the fatal shooting of an unarmed black teenager by a white policeman on August 9. In addition, Afkham called on the United States as a signatory to the Convention on the Elimination of All Forms of Racial Discrimination to adhere to the provisions of the convention. This entry was posted in America, United States and tagged African American, Black, Ferguson, Missouri, Racial Discrimination, Racist. Bookmark the permalink.